The above is a sample of the November 4, General Election ballot of the Town of Milo, Yates County. If you click on it, it will enlarge. 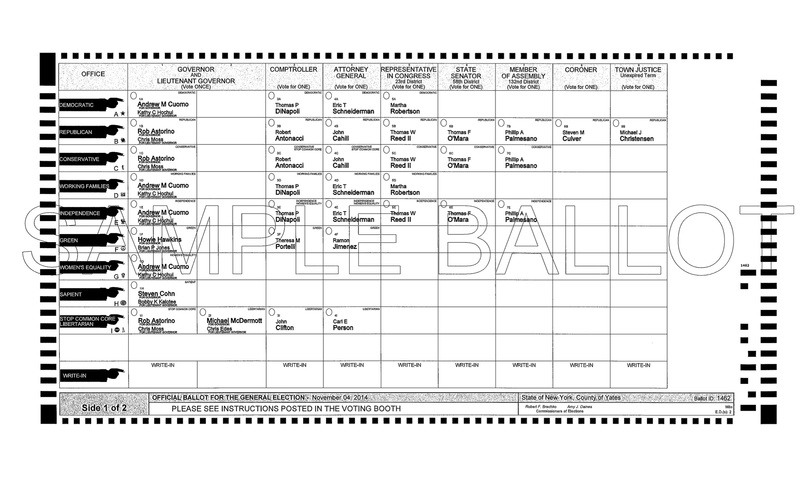 All ballots in the NY 23rd will be set up in a similar format for the Governor/ Lt Government, Comptroller, Attorney General and Representative in Congress columns. The other columns could be different depending on the races in your State Senate District, State Assembly District, County, City, or Town. The NY 23rd Counties in the 8th Judicial District (Allegany, Cattaraugus and Chautauqua) will have a race for FIVE Supreme County Justices. Those columns will be between the Attorney General and the Representatives column. To view, and download/print your sample ballot, you need to go to the presented links and then find the link to your town (or City). You may want to email the links to others—many people are known to study their ballot before they vote. The other counties may place their sample ballots on line. You may want to go to the NY 23rd’s link to the Board of Elections to see if your county add your ballot. Please realize there will be at least 3 propositions which you can vote on. They will be on the back of the ballot. Keep an eye open for an article on the New NY 23rd summarizing those propositions. This entry was posted in 2014, Constituents, Rights. Bookmark the permalink. 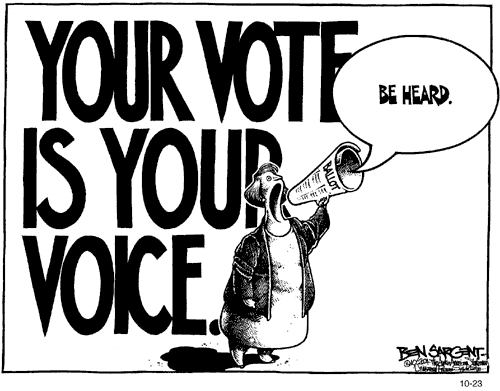 Information about the redistricting amendment supported by the LWVNY. Thanks for posting that, William. It could well turn out to be one of the most important decisions of this election cycle. So, a vote FOR the amendment will stop gerrymandering in NYS ? Is that correct ? Thanks ! That would be the goal of the bipartisan commission, but the plan still has to approved by the Legislature. This amendment also provides the guidelines for the districts. I agree with William that this is better than the current process. The Commission would be responsible for State Senate and Assembly districts, and the Congressional district. Currently NYS legislators choose their constituents rather than vice versa. The NYS Senate draws the districts for the Senate while the Assembly draws its districts. A glance at the maps clearly shows that they are designed for political advantage. After the 2010 census, the legislature was unable to agree on fair districts for Congress, so the courts drew the map–that’s how we got the current NY-23.